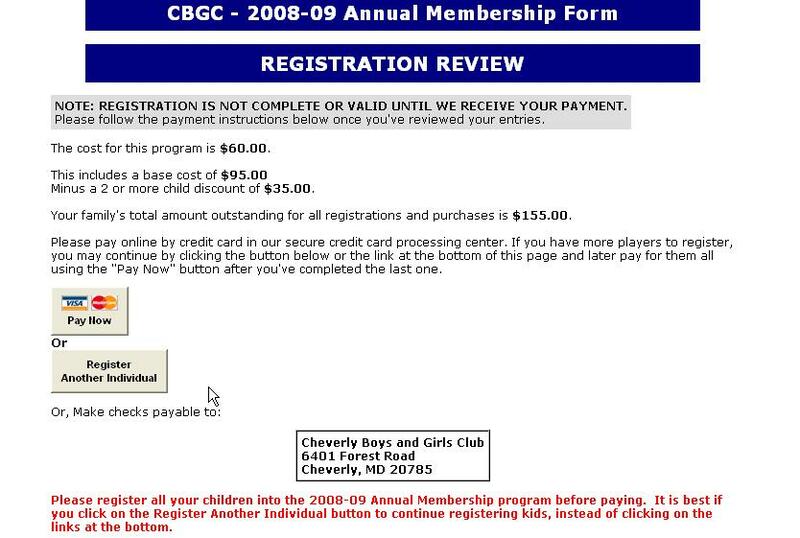 On this page, we guide you through how to register your child and pay the registration fee so that your child can participate in a Club sport. Please note that you will need to create a record for each child that will participate in the club, and register them through the registratoin form for each sport. These instructions assume you are going through the registration for the first time, and that you just created the guardian records and the first child's record. However, you can follow these steps even if you are not in the process of registering for the first time. You will have got to this point by clicking on the Register button of the Registration form. Whatever information you put in the form will automatically transfer to other children and to the registration forms for specific sports. Pay for the registration or register another child. Its best if you pay for all your children at once, but you can choose to pay at any time before your child plays in their first sport. Please be thorough and enter all the information if you can. If you must enter it later, put in NA and come back later and update the annual registration form. An asterik means that it is required. 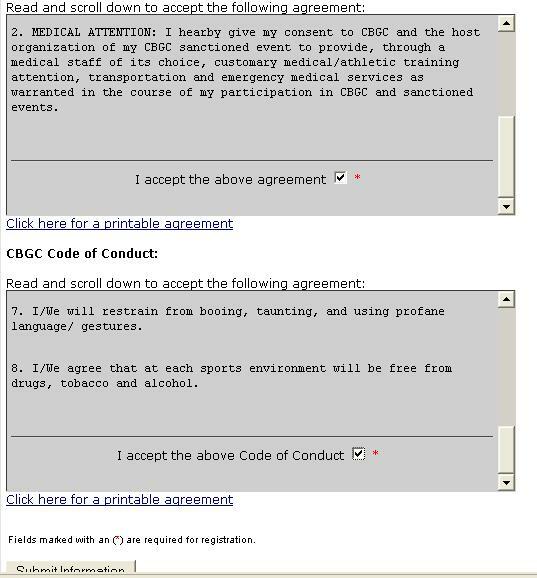 You will need to scroll down to the bottom of each agreement, and click in the box to indicate that you agree with the agreement and Code. This form allows you to either click on the 'Pay Now' button, or click on the 'Register Another Individual'. If you choose to register another individual, you will be able to pay for both at once when finished. Please read the form carefully the first time, and print it if you wish. You will receive an email confirmation of this transaction. At the bottom of the form you can click on the 'Print this Page' link, or Return to the registration home page'. You can also click on the 'Register Another Child' button at the top to register another child. By clicking on this button, you will be able to register another child. 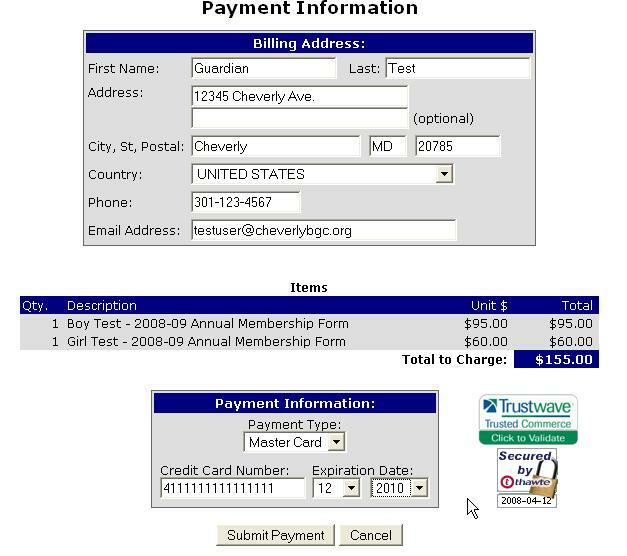 Don't pay now since you are in the process of registering another child. Notice that the buttons next to the Guardian names are grayed out and say 'Ineligible'. 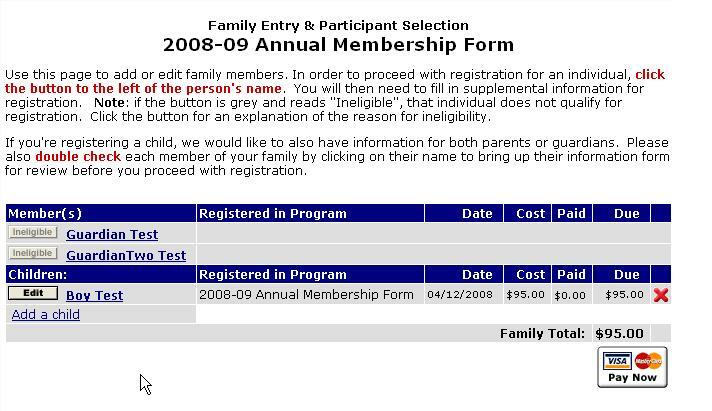 That is because the Annual Membership form must be filled out for children since the form requires that the individual have a birth date in the system that falls within the 'born between' range shown above. The system remembers all the previous information you entered. Make sure to correctly enter the birthdate and gender. Enter the second child's health information & accept the Agreement and Code of Conduct again. Notice that the cost for the second child is less. You will see the following screen. Make sure you enter your name and card number and expiration date correctly. After you submit, you will get a confirmation email. Follow directions to try again. The message will look something like the image below. 12) Congratulations, you have paid the annual membership, and are now ready to register your child in a specific sport. 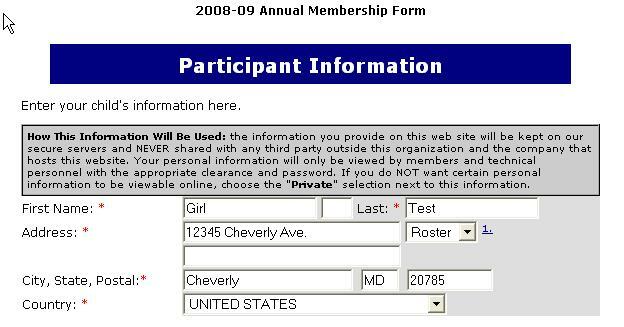 You may now go to the next help screen, Register your Child into a Sport.